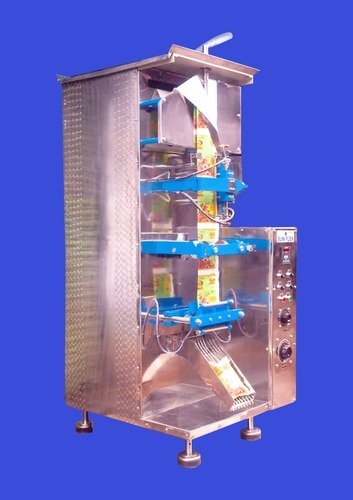 We Sun Packaging Systems are leading Manufactueres of all types of Pouch Packing machines with brand name of Sunflex. The above above machine is fully automatic necgabucakky operated vertical farm fill and seal machine to pack viscuss liquid such asEdible Oil, Ghee, Honey, Automobile Oil , Paints,Pharmaceauticals , Syrups, Shampoo, Warnish, resins etc. Packaging will be 200ml to 1000ml. Incorporated in 2004, we, Sun Packaging Systems, are manufacturing and supplying a wide variety of Packaging Machinery. Our product range Inclusive of Powder Packaging Machines, Liquid Filling Machines and Milk Packing Machine. Offered products are made by utilizing the optimum quality components and latest technology machines for manufacturing process. Owing to their smooth finish, sturdy construction and high performance, the offered range of packaging machines are much appreciated among our valued customers. Apart from this, we are offering these products at leading market prices. We are supported by an efficient team of qualified professionals to manufacture the most suitable products for our valued customers. These professionals are appointed through various tests and interviews based on the required work experience, domain knowledge and skills. Being in the touch of upgraded technology, our skilled professionals are always ready to learn the updated one. To enhance their skills and knowledge, we also provide the required trainings to them over a specified time frame.